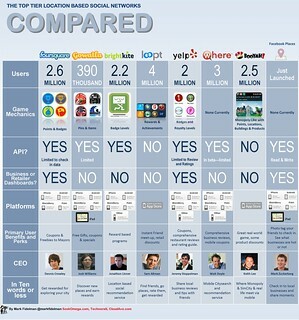 The location based social networking space (LBSN) fascinates me. And with the arrival of Facebook Places the space is going to heat up fast. But when I first set out to discover the ideal LSBN for my lifestyle it was a difficult process. 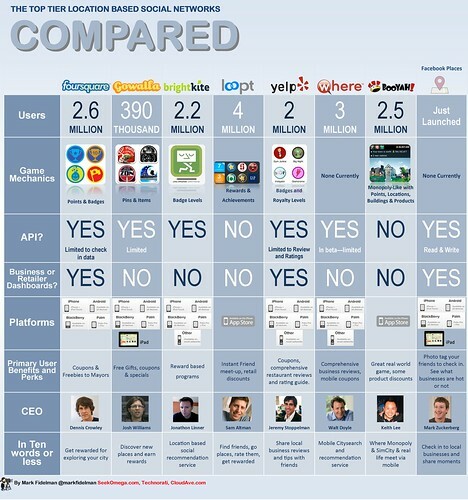 There were a few comparison guides between Foursquare and Gowalla but nothing that covered all of the major players in the space. Therefore the process (at least for me) took several weeks and several experiments with each of the Tier 1 LBSN’s. Well instead of making you suffer through the same process, I decided to make an infographic decision guide matrix for you in order to help you decide which LBSN to use.